Avoiding spoilage, bacterial growth, and contamination are a foremost concerns of food safety. 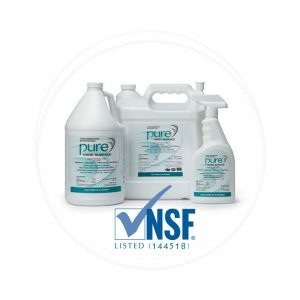 However, there are ways to improve the quality and safety of food that may not be as immediately apparent as properly washing and sanitizing equipment. High-quality lighting—made possible on a large scale with the rise of LED technology—improves food safety in a number of ways during the journey from farm to table. Over the past decade, LED lighting has transitioned from an expensive fringe-player in the realm of industrial and commercial lighting into the ideal choice for efficiency- and safety-minded companies. Rapid advancements in technology have driven prices lower, and, when combined with utility rebates and energy-efficiency tax incentives, upgrades to LED lighting can be cash flow positive from day one. When compared to metal-halide and fluorescent lights, LEDs can offer superior energy efficiency and energy savings of up to 50 percent. They also run cooler, last longer, and frequently have a better color rendering index (CRI)—a number which indicates an artificial light’s ability to depict colors as accurately as natural sunlight. Additionally, traditional lighting dims quickly over the course of two or three years, plunging facilities into darkness without routine maintenance. The best LED fixtures can keep facilities at ideal foot-candle levels for up 150,000 hours, more than 17 years of 24-hour use, with little to no maintenance. While these benefits are important, those in the food supply chain will truly appreciate LED technology for ways in which it improves food safety across a range of facilities, such as food processing plants, cold storage, and restaurants. In these spaces, which are filled with heat-generating equipment, grinders, slicers, and more, lighting should go above and beyond the OSHA minimum. Proper lighting can prevent costly mistakes, such as slip-and-fall accidents and other employee injuries. It can also help prevent employees from dropping or knocking small items, such as tools or bolts, into food processing machinery or raw materials. Proper lighting goes beyond brightness—high-quality LEDs also provide a higher CRI than traditional lighting, as noted above. Lights with higher CRI will allow food production employees to more accurately spot mold, discoloration, and other defects. A single incident can compromise food quality and require a costly recall; bright, clear LED lighting goes a long way toward mitigating this risk by increasing visibility and making misplaced items and defects easier to spot. Thus, while LED lights don’t directly increase food integrity in the way an improved sanitization method might, they indirectly improve food integrity by allowing workers and technicians to perform their jobs competently and safely. Furthermore, LED fixtures don’t use mercury-filled glass bulbs to house their lighting elements. Without bulbs, there is no chance of broken glass finding its way into food. In this way, an inherent feature of LEDs provides a direct safety benefit when compared to previous, glass-covered lighting fixtures. To completely eliminate any chance of debris falling into food, purchase fixtures that feature impact-resistant construction. While LEDs provide safety benefits in all food storage environments, their impact is most noticeable in cold storage areas. Traditional bulbs have to warm up to reach full brightness. This can take anywhere from a couple minutes for fluorescents to 15 minutes for metal halides. This warm-up time is even longer in a cold-storage environment—anyone who uses a fluorescent fixture is likely familiar with the dim, purple flicker of a cold bulb. Low temperatures also increase degradation and reduce the overall lifespan of arc-based bulbs. I wish LED manufacturers would catch up with the needs and specifications of the food industry. We cannot have glass and/or brittle plastic lens whereas that is mostly what is available especially in strip lights. Even if you follow their product menus and get to food – the standard lens are acrylic which is considered brittle plastic. Yes you can get big oversized water-proof polycarbonate but who wants those if you don’t have a wet environment. I had to go with a Lithonia poly design which unfortunately pushes the light straight down vs several other more attractive and better light pattern (up/to the side/down) but those lens were designed in only acrylic. Several years ago ran into the same on high bay lighting with glass vs polycarbonate lens. LED’s are great but do the manufacturers really know or care what the huge food industry needs in order to pass our food safety audits? Acrylic is brittle plastic which is not considered any better than glass in a food setting.